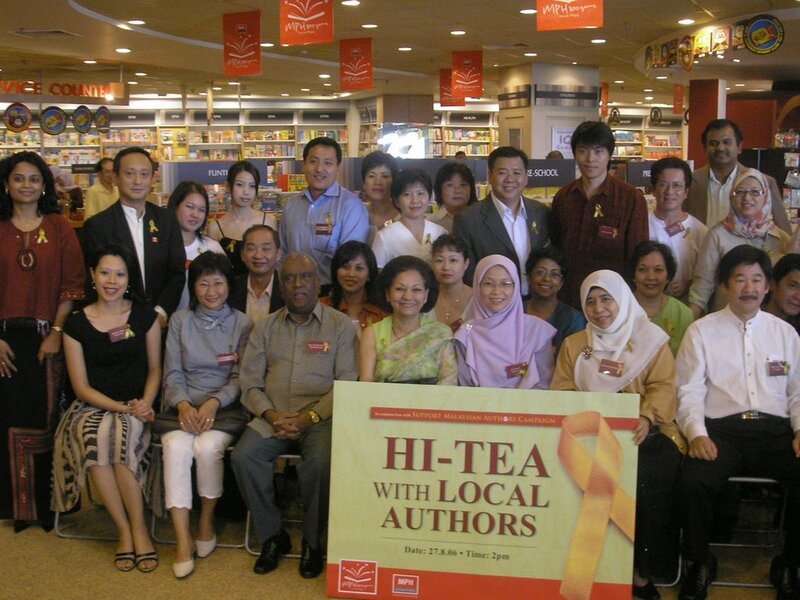 Went along to MPH's annual Hi-Tea with Local Authors yesterday, part of the book chain's Support Local Authors Month. (Turned up a bit late because I had to take a cat to the vet first, in case anyone was wondering why the grand entrance half an hour into the session!) There turned out to be a discussion about e-books in progress with writers Shoba Mano (below left) and Lydia Teh (centre, chairing the discussion), and editor Eric Forbes. And the Booker room was absolutely packed. Sad. Because I reckon that many local authors could sell their work (non-fiction especially) to an overseas market in this format. How many of them, though, have even established an online presence? After that the session seemed to lose focus somewhat. (Shoba sent round an e-mail later which expressed her dissatisfaction on a number of counts. I can sympathise, though perhaps she could have been more diplomatic.) I think it wasn't really a topic that local authors and audience couldn't really relate to, and perhaps better kept for a writer's circle meeting. Dato' Ng, CEO of the MPH publishing group, putting discussion back on track, highlighted the Ministry of Education's failed e-book project and predicted that e-books will come, but never take over from the printed word. The tea afterwards was an excellent opportunity to meet up with writing friends and make new contacts. (Pictured above, the local authors.) Afterwards, I bought books (how could I not?) and then had a lovely long bookchat with Eric over frosty lemon tea at Delicious. Do read Lydia's account of the event. 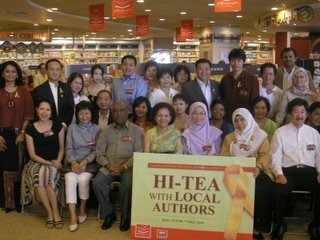 You might like to check out the account on Ted's blog of the previous week's fun and games and intrigues at Sembang-Sembang Bersama Penulis Melayu: MPH's event for Malay writers. 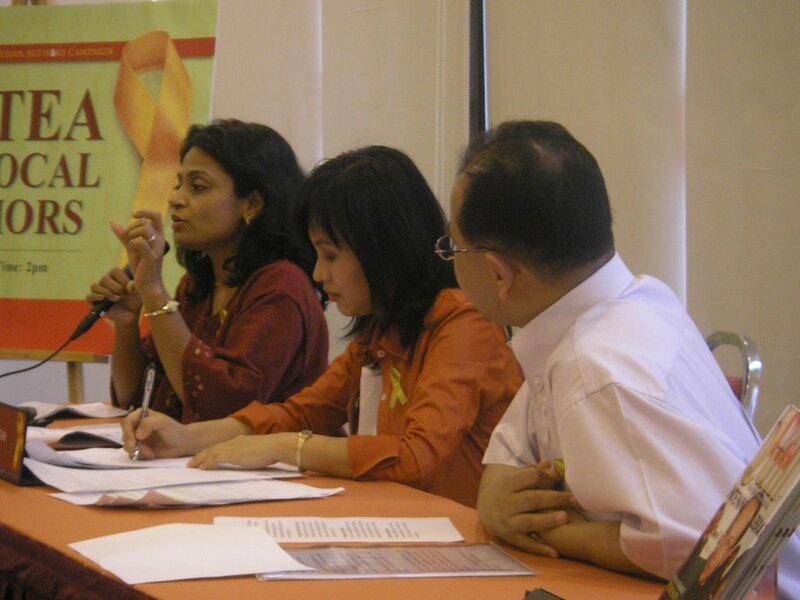 Nisah Haron's account of the same event is here. Sharon, astute post. Good conclusion there : interesting things happen when a bunch of writers of different genres get together. If we're all as nice as you, things won't get ugly, that's for sure, even though there might be disagreement. haha! good maths problem ... how many writer's egos can you fit into a room? Sharon, it was nice seeing you again (the last time was Silverfishbook Litfest).I love the diversity of us all.Great personalities, very opinionated -- signs of a great nation growing fast! Good what! I look forward to meeting a bigger crowd next year! I'm not sure if things have changed with e-books, but from what I know, e-books are always tied to their reader software. The problem with reader softwares is that, we can't ensure that they stay the same across versions. Would e-books published now be readable 20 years down the road, when newer pieces of softwares are used (and we know how fast the IT world moves). Or would the user have to locate exotic reader software just to read an e-book they had legally bought some years back. This without even considering things like Digital Rights Management, which would be another pain if somehow the user had screwed up their system, and they have to justify to the company that published the e-book, why they need to reinstall the reader and get another copy of the book without paying again. And then there's the question of how portable the e-book is. Can it be used with different devices or stuck with only one platform. How does it scale? Well, what else can I say (that hasn't been already said!) about yesterday's event? Trust me, I went every year and yes, perhaps the heat of a sardine-packed room got into everyone. There has always been a drama or two. Anyway, it was great that so many people attended but (sigh), so little time for the aspiring authors to ask questions (which I believe, has been the reason why many attended). Aha, that's where writer's blogs can help. Thanks to you, Eric Forbes, Ted Mahsun, John Ling, Xeus, Yvonne Foong and of course our dear Lydia (she did a fantastic job yesterday, despite that situation) and many others; everyday we newbies can hold some form of discussions on writing even without stepping out of the house. Betul? how nice to hear from you all! faridah - yes, diversity indeed, great fun. it was so good to see you after so long. actually i think the last time we met was at the aussie high com when snw2 was being launched. are you still fictionating? tell us about your book! yvonne - was it really so long ago? i guess i've seen your picture around so much, you look so familiar. i bought your book and think i'm going to enjoy it. especially as i worked for a year or so with malaysia airlines designing a language training package for cabin crew and got to hear some great stories! Hi Sharon! You still have that same warm smile. Hope to have more meeting opportunities. Thanks for getting my book and I hope you will be enlightened and pst,pst, when you fly, try to spot if the cabin crew propel into immediate action when the command "crew arm and cross check all doors" comes on the PA.
try to spot if the cabin crew propel into immediate action when the command "crew arm and cross check all doors" comes on the PA.
xeus - you think that because i'm an artyfartylitteri that i can't appreciate a well told suspense story? i like to be scared and suspensified. (just not by cabin crew on a plane!) shall add you to my list then for next month. keep 23rd free and i'll get back to you.